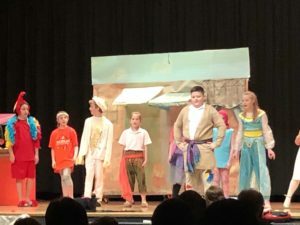 Last weekend I was lucky enough to attend the Cambridge Elementary School’s production of Disney’s Aladdin Jr. It was a completely delightful production, with great sets and costumes and stellar performances all around. The amazing cast included Alexandra Pederson, Drake Webster, Tessa Couch, Carter Hamilton, Nolan Hunt, Ella Hunt, Christian Colvin, Drew Shaner, Isaiah Lohret, Gabrielle Hackman, Danyelle Trinkle, Eve Armand, Carson Sartoris, Peyton Drew, Estella Kvinlaug and Emma Periard. What struck me the most – and what seems most important in any student production – is that the students were having a blast. They were energized, excited, and full of joy as they ran around that stage (and at one point around the whole audience). They seemed to feel honored by the work that the CCS faculty and staff had done to support and lead them through the production process. It was quite a labor of love, especially by a few fantastic people. The Production Team consisted almost entirely of Directors Rebecca Discepolo & Jill Chadwick – who also served as Music Director, Choreographer, Set Designer, Costume Designer, Stage Manager and Sound Designer – wheh! The one piece of production handled by someone else was Lighting Design, created by Nick Jancik. 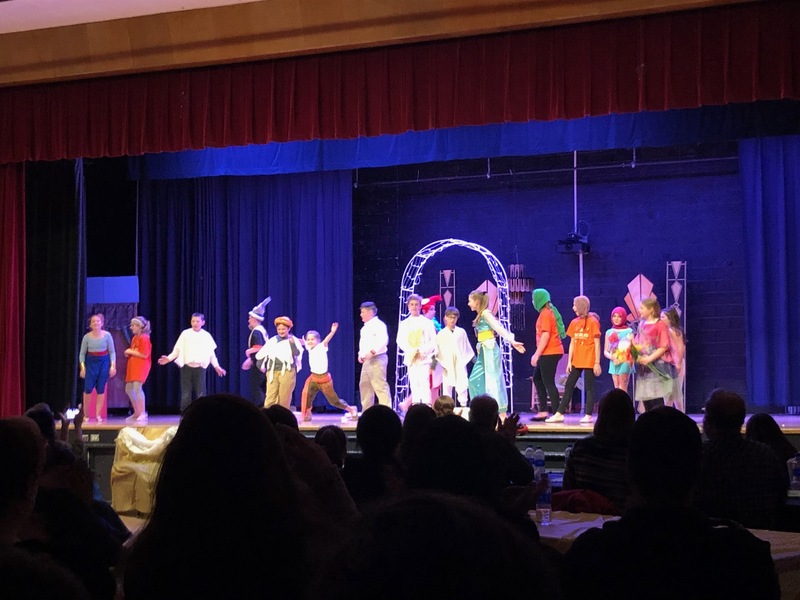 With these three people supporting the process – and I assume with hours of parent and student volunteer time – they built a show that successfully told the story of Aladdin, while giving the students room and opportunity to truly play. I trained as an actor at New York University’s Tisch School of the Arts under the legendary theater leader Zelda Fichandler, one of the founders of the resident theater movement in the 1950’s and of Arena Stage, one of the largest regional theaters in the country today in Washington, where I worked until moving to Cambridge five years ago. One of Zelda’s big lessons to us was to remember that a “play” is called that because it’s supposed to be play – like when we were kids. Oftentimes in the theater, artists can become so serious or worried about doing a good job, they lose the sense of play – and so they lose the reason for doing it in the first place. As Ron Van Lieu, our master acting teacher used to say: “It better be fun – otherwise why do it?” And these kids were clearly having fun, laughing, supporting and prodding each other to keep the fun going. They stayed in character, created the scene and pulled the audience along for an amazingly fun story, all while having a great time themselves. While watching these young people, I also kept thinking about my first time on stage. I was five. My kindergarten teacher was directing the high school play. There was a character in the play that had a beloved doll – and in one dream sequence that doll came to life, just sitting on the girl’s lap. My teacher needed a well-behaved kid to sit quietly on stage for that scene – and knowing I was a well-behaved kid, she picked me. I had one rehearsal and maybe we did one performance. I just remember the moment the lights came up and shined in my eyes, as the audience gasped at the doll having come to life. I was hooked. All I had to do was sit there and be alive. And it was magic. I could see some of these students having a similar experience – a magical time on stage, as children, before any cares of being serious about it all come into play. And even for those who might never do a play again, they were having a great time, working as a team of friends and learning how much more they can accomplish when they work together and dive deep into their own imaginations. They also again learned the quality of doing good, hard work – and being supported and rewarded by their community for it, with a standing ovation. Special thanks and applause again to Jill Chadwick, Rebecca Discepolo, Nick Jancik and everyone at CCS, including Superintendent Vince Canini, Elementary School Principal Colleen Lester and Assistant to the Superintendent Kate Emerson, who were all there on opening night to cheer these kids on. As we gear up to open Annie at Hubbard Hall with the High School Drama Club, I am thrilled that the elementary school production was so wonderfully supported. Aladdin Jr. is based on the 2014 Broadway production of Aladdin, produced by Disney Theatrical productions and directed and choreographed by Casey Nicholaw. The Broadway production also featured the one and only Nathan Lucrezio, a CCS graduate who recently spoke at graduation. Based on the Disney film written by Ron Clements, John Musker, Ted Eliott and Terry Rossio and directed and produced by John Musker and Ron Clements. Note: This post was originally published in the Cambridge, NY local newspaper The Eagle, where the author writes a twice-monthly column.